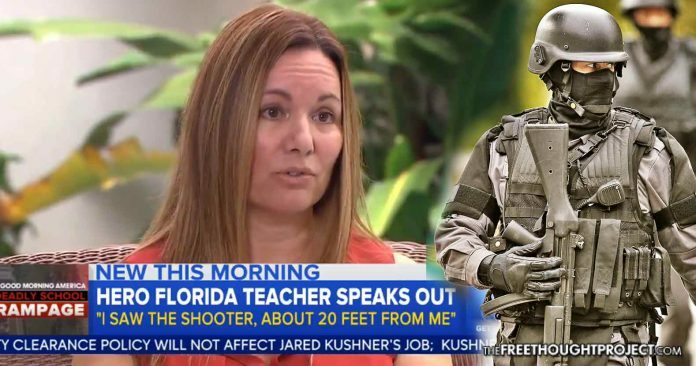 A teacher who witnessed the Florida School shooting said she saw the shooter firing a barrage of bullets down the hall and she immediately thought he was a police officer because he was wearing full body armor. Parkland, Florida – A teacher at Marjory Stoneman Douglas High School said she encountered the man who reportedly shot and killed 17 people, and she initially believed he was a police officer, based on the body armor he was wearing and the unidentifiable firearm he was shooting in her direction. Stacy Lippel, a creative writing teacher at the school, told Good Morning America that the Valentine’s Day rampage began with a fire drill, which forced all of her students out of the classroom and into the hall. Within seconds, gunshots rang out, and as students began panicking and screaming, she said she ushered them back into her classroom. Other reports have claimed that suspected gunman Nikolas Cruz was wearing body armor at the time of the shooting. CNN reported that Cruz was a member of a group chat on Instagram where, in addition to sharing details about the firearms he owned, making racist comments and sharing his desire to commit mass murder, he also said he purchased body armor. This was far from the first time Cruz warned that he planned to commit mass murder or to carry out a school shooting. He spelled it out clearly on YouTube, leaving comments that said “I’m going to be a professional school shooter,” that he was “going to kill law enforcement one day.” Yet despite multiple credible reports to the FBI and at least 20 calls to local police that warned of death threats from Cruz, law enforcement did nothing to attempt to prevent the shooting. On the day that Stoneman Douglas was attacked, Stacy Lippel told GMA that she saw the shooter and then quickly closed her classroom door, while urging her fellow teacher, Scott Beigel, to close his door as well. Scott Beigel was one of the 17 people killed in the attack. Even though the shooter was only near her classroom for moments before he continued his rampage down the hall, Lippel said that she and her students stayed huddled in the room. “I never really knew when he left because we all thought he was still here,” she said. Lippel said that it took nearly an hour for police to finally enter the hallway and to begin assessing the wounded students and teachers. She also noted that because the shooter was wearing an outfit that made him look like a member of the SWAT team, she was hesitant to let the officers into her classroom. The latest details describing the shooter raise significant questions about the timeline of the shooting. According to a report from the Sun Sentinel, Cruz was picked up by an Uber at 2:06 p.m. and then dropped him off at the school at 2:19 p.m. He then entered the freshman building at 2:21 p.m. The timeline comes in addition to comments from other students claiming that they believed there were multiple shooters. Student Alexa Miednik even said she had a conversation with Cruz while she was evacuating the school, and she heard additional gunshots in the background. During that time period, while the gunman was allowed to roam freely about the school building, at least four armed police officers cowered outside. The school resource officer, who could have taken out the attacker within minutes, and the three officers from the Broward County Sheriff’s department who were the first to arrive at the scene, stayed outside and waited for reinforcements, while innocent children died inside.